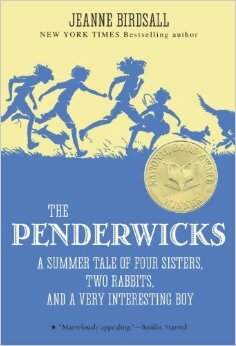 It got me thinking about the books I enjoyed when I was about the age The Penderwicks seems written for — the School Library Journal says Grades 4-6, but allowing for readers who are more precocious than they expect, let’s say ages 7 to 10-ish. Most of my favorites were historical fiction, one way or another: Alison Uttley’s A Traveller in Time, for instance (which I’m thrilled to discover has been reissued in the New York Review Children’s Classics collection), or Barbara Willard’s The Lark and the Laurel and The Sprig of Broom. I still have my crumbling copies of these, along with Barbara Leonie Picard’s Ransom for a Knight. I read all the Little House on the Prairie books, of course (I still have my original box set), and the Anne books, and Little Women (in my mother’s illustrated edition) — but it was the ones about brave girls having adventures in long-ago times that appealed most to my imagination. Those books were the gateway drugs to the “adult” historical fiction I read avidly throughout my tween and teen years, especially Jean Plaidy’s many series (also, I see, now being elegantly reissued) — which in turn led me to, well, where I am today, though I thought at the time that I would end up a historian. I don’t have any counter arguments, though, except that I really love them. Which is no argument at all. I think they get even more interesting, though, if you ever feel inclined to keep going with them. No, no, it’s definitely a good thing! No counterarguments from me! It is a young book, and I think it varies so much reader-to-reader which books for kids will be still enjoyable if you read them as an adult. I love the Penderwicks series, but it reminds me very strongly of a lot of books I loved when I was a kid — Edward Eager, E. Nesbit, Elizabeth Enright in particular. (Hm, strong representation from the letter E here.) The most recent one made me cry. When I look back at my childhood reading, I’m surprised at how little tolerance for darkness I had. I read almost nothing that was scary, whereas now I really enjoy dark, creepy stories. Oh, E. Nesbit – yes! I had a particular fondness for 5 Children and It. I suppose I can see the nascent Victorianist in that preference: it’s quite a moralizing book, as I recall. I didn’t like scary then, though, and I still don’t. E. Nesbit for sure, as well as Hugh Lofting’s Dr. Doolittle books (all borrowed from the library; not owned, as was the Dr. Seuss series). When I was about six, a relative gave me my first book, Catriona and the Grasshopper, by Bryan Guinness (the first husband of Diana Mitford). It has the most wonderful mid-Victorian-style illustrations, and my statement of ownership is inscribed in childish printing. Guinness wrote some other books, but all are out of print. And I owned the Pooh books, also presents from relatives who wanted to give me the reading bug, and boy did they succeed. These books imparted a love of nature and animals, helped along by Beatrix Potter (just read her biography, by the way, which tied into Elizabeth Gaskell’s biography because, as an old man, Elizabeth’s widower knew Beatrix and was very kind to her). When I was older, I loved Rosemary Sutcliff’s books, as well as Plaidy’s, as you did. I’ve gone through so many books, I can’t remember them all, but I never wanted scary stuff either. Other than the sense and appreciation of the absurd gained from Alice in Wonderland and Through the Looking Glass,I don’t particularly see signs of the person I grew up to be in my childhood fiction reading, which mostly involved some form of fantasy. My non-fiction reading – The Diary of Anne Frank, and books about Harriet Tubman, Jeanne d’Arc and the Salem witch trials – is far more predictive. I love all the books in the series so far and I agree with Dorian that they get even more interesting. The sisters get into more trouble and the fourth book is very sad and quite disturbing. For obvious reasons I also like the way Birdsall draws on Sense and Sensibility in the second book.